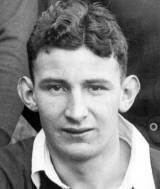 Former Wales and Lions scrum-half Tanner made his international debut as an 18-year-old in his country's 13-12 victory over New Zealand in 1935 and also played for Swansea when they beat the All Blacks on the same tour. He went on to win 25 caps over a record-breaking 15-year period. At the age of 21, Tanner was selected for the 1938 Lions tour of South Africa and featured in the second Test against the Springboks. He died in his sleep at the age of 92. Bleddyn Williams, who played with Tanner, said, "Among all the scrum-halves I've seen and played with, he would reign supreme."